A water wall boiler maintenance tool that mounts securely to the tube I.D. for removing membrane, cladding, and beveling simultaneously with minimal vibration is available from ESCO Tool of Holliston, MA. The Esco Wart MILLHOG® is a boiler tube machining tool with a proprietary membrane and overlay cladding removal head that creates a clean bevel, all in one operation. Featuring a heat-treated draw rod assembly designed with clamps that expand on the mandrel and clamp rigidly to the tube I.D., it machines water boiler tubes from 2” to 3” O.D. with minimum vibration. 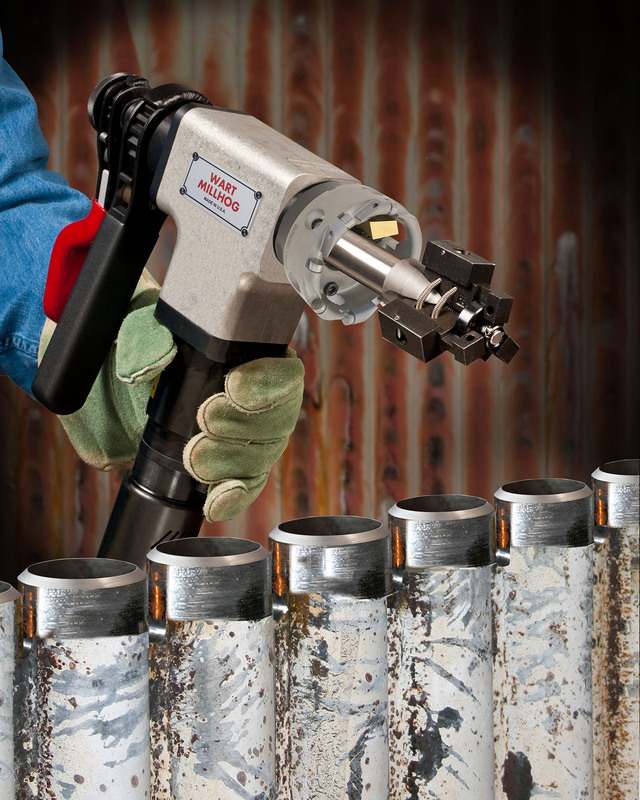 Equipped with attached clamping and ratchet feed tools, the Esco Wart MILLHOG® uses TiN coated cutter blades to machine highly alloyed or high chrome content boiler tubes without using cutting fluids. It has a sealed mandrel to prevent debris from entering the tool, dual opposed tapered roller bearings, and is offered with pneumatic or electric motors. The Esco Wart MILLHOG® equipped with the membrane and cladding removal head and pneumatic motor is priced from $5,795.00 and is available for rent.